The Minnesota Timberwolves aren’t exactly Timberpups anymore. Karl-Anthony Towns and Andrew Wiggins are well into their NBA careers at this point, while the Wolves’ lineup features seven players with 5-plus years of experience. 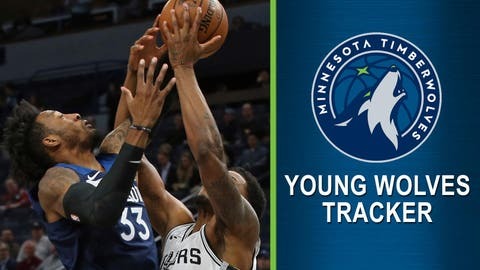 Welcome to the 2018-19 edition of the Young Wolves Tracker, formerly the Timberpups Tracker. Each Thursday we’ll either track the progress of the Iowa Wolves players who might be of help to the Timberwolves in the future, or a current member of Minnesota’s roster. We’ll also give updates on the other young players from the previous week. This is the 4th edition of the 2018-19 Young Wolves Tracker. A disclaimer: Covington is not “young” in the basketball sense. He’s a 27-year-old, sixth-year forward coming off his first appearance on the All-Defensive team. He is, however, young in the minds of Wolves fans, who are being exposed, possibly for the first time, to RoCo, the stellar defender and capable shooter. Covington led the way in the Wolves’ eye-opening win over the San Antonio Spurs on Tuesday, finishing with 21 points, nine rebounds, a steal and an assist. He also had a plus/minus rating of plus-44, one of the highest marks in Wolves history. But this isn’t just a one-game thing. The Wolves are 7-2 since the trade, and at 99.8 points allowed per 100 possessions have had the league’s best defense over that span. Outside of one truly awful night against the Bulls in which he shot 1-for-18 from the field, Covington has been as-advertised since arriving in Minnesota. He’s now led the Wolves in scoring in back-to-back games (wins over Cleveland and San Antonio), and is averaging 14.3 points, 5.8 rebounds, 2.8 steals, 1.1 assists and 1.0 blocks, while shooting 40 percent from 3-point range. — Josh Okogie scored 12 points in around 10 minutes of action against the Spurs, and did this. YEAH. — Karl-Anthony Towns had 35 points and 23 rebounds in a win over Chicago on Saturday, a significant stat line for a few reasons. — The Wolves’ other pick in this year’s draft, Keita Bates-Diop, had 18 points and seven rebounds for Minnesota’s G League affiliate Saturday, after leading the team with 20 points in a win over Oklahoma City on Friday.